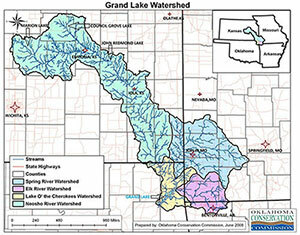 GLWAF, Improving Water Quality Within the Grand Lake Watershed. The Grand Lake Watershed Alliance Foundation, Inc. (GLWAF) was formed in 2007 to help preserve, protect, and improve water quality within the four-state watershed. A 501(c)(3) non-profit corporation, GLWAF is the only organizational voice for the entire watershed. The Alliance already has achieved important milestones. After a thorough professional assessment of Grand Lake’s water quality, the organization developed a strategic plan that establishes key initiatives that are essential for the protection of the watershed. 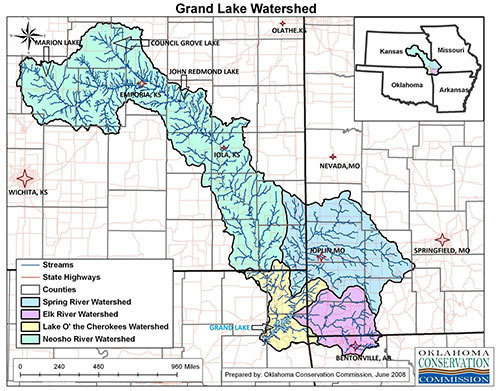 Just eight percent of the watershed is located in Oklahoma; therefore, involvement by stakeholders from each of the four watershed states is critical. For example, the Alliance Board of Directors includes representatives from all four states. Federal and state agencies, including the Grand River Dam Authority (GRDA), have welcomed and encouraged our efforts to energize citizen participation in management of the watershed. The Alliance also supports existing watershed groups’ efforts in public education and water quality improvement. James Triplett, Kansas – James Corbridge Jr., Oklahoma – Tom Collinson, Kansas – Rick Hines, Kansas – Carl Metcalf, Oklahoma – Rick Littlefield, Oklahoma – Pete Churchwell, Oklahoma – Roger A. Norbeck, Arkansas – Steve Duff, Oklahoma – Pack St. Clair, Kansas – Christen Lee, Missouri – Darrell Townsend, Ex-officio.